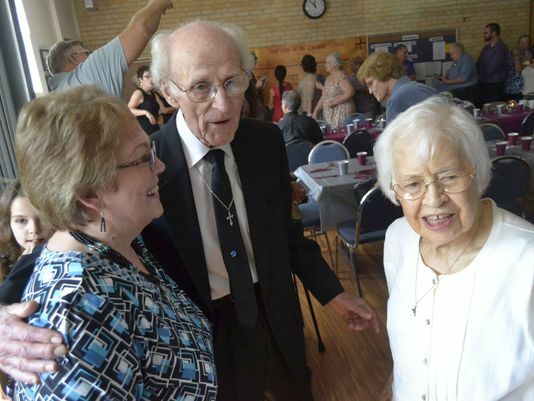 This was too good not to publish – The congregation from Green Bay’s St. Matthew Orthodox Church celebrated the 70th wedding anniversary for church members Bronnie and Annabelle Stroud. When he leads the Sunday morning liturgy, Father Maximus Cabey needs only to gaze out to his congregation to find inspiration in the flesh. “It’s being faithful through the thick and thin of life,” said Cabey, the rector at St. Matthew Orthodox Church in Green Bay. That is how Cabey sees Bronnie and Annabelle Stroud. Not only are the Strouds regular attendees at Cabey’s church, but they also have the unusual distinction of being married 70 years. More than 125 family, friends and church members filled the St. Matthew nave for the worship last Sunday and also its dining hall for a special post-service reception. They honored Bronnie and Annabelle for their milestone wedding anniversary, which was Aug. 31. As part of last weekend’s liturgy, Cabey offered a blessing to the Strouds. “It’s taken from the marriage service, just as a way of honoring them and asking God to bless the marriage again,” Cabey said. Cabey also presented the celebrated couple an icon with Joachim and Anna, who are considered patron saints of marriage, and a letter of commendation known as a gramota from the Right Rev. Paul Gassios, the bishop of the Midwest Diocese of the Orthodox Church in America. Besides their consumption of natural foods and taking “the right vitamins” the last several years, Annabelle credited a shared devout faith in God for the longevity of her marriage with Bronnie. “Interest in the church and Christ, is what keeps us going,” said Annabelle, 94, who is two years older than Bronnie. The couple converted to the Orthodox Church five years ago after they had served the Assemblies of God for many years. Bronnie, an Indiana native, is a retired Pentecostal minister. The Wisconsin-born Annabelle, who is from the town of Harrison, also did ministry as an evangelist and a church musician. After meeting as students at Central Bible College in Springfield, Mo., in the early 1940s, Bronnie remembers Annabelle going off to preach and play her violin at churches and tent meetings in North Dakota. “I had to keep up with her,” Bronnie said. The couple married in summer 1945 at what was called the Gospel Temple in Appleton. “Most of (the 70 years) have been right here in Wisconsin, except we were in Africa for about eight years (as missionaries) and in Illinois for a few years,” Bronnie said. He pastored Wisconsin churches in Waupaca, Clintonville, Tomah, Rice Lake, Oshkosh and Appleton before retiring from full-time ministry in 1999 at age 76. “Time has gone fast, really,” Annabelle said. The Strouds have four children, 22 grandchildren and 29 great-grandchildren. Many of them attended the festivities Sunday.